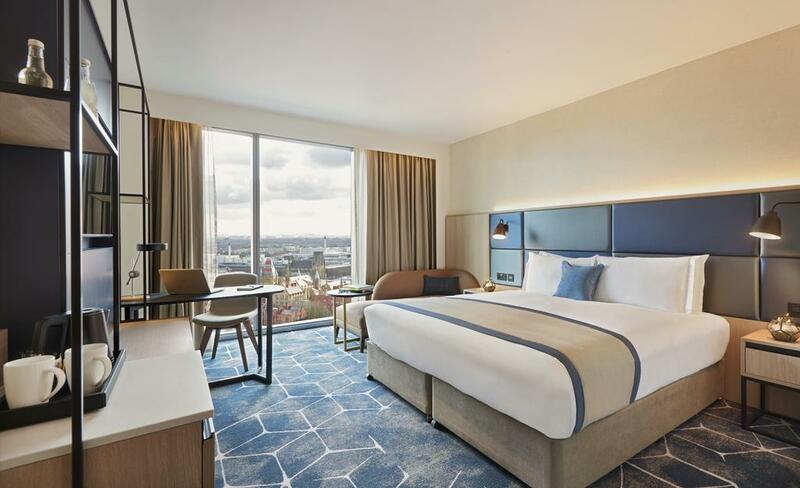 M&L Hospitality, the Singapore-based hotel investment platform celebrates the opening of a new 19-storey hotel development, The Lume, in Manchester, UK. Boasting both Crowne Plaza® and Staybridge Suites® hotel brands, the hotel has officially welcomed its first guests this week. The Lume hotel development, named as a celebration of the light-filled ‘illuminated’ hotel also recognises the textile ‘loom’, an innovation that will forever be linked to Manchester. Located in the bustling Oxford Road area within walking distance of the city centre, the newly completed 328-room hotel development marks M&L Hospitality’s first property in Manchester, bringing their UK portfolio to 5 hotels. Travellers to the north of England will now have a new way to experience Manchester; the choice of two different IHG® (InterContinental Hotels Group) hotel styles under one roof. Located on the upper seven floors, Staybridge Suites will offer a mix of 116 modern studio and one-bedroom suites featuring fully-equipped kitchens and panoramic views of the city from the terrace on the 18th floor. Occupying the lower 12-storeys, Crowne Plaza will feature 212 guest rooms, a 120-seat restaurant, bar, fully equipped 24-hour gym, club lounge and seven state-of-the-art meeting rooms catering for over 200 delegates. The Lume is located on the Oxford Road Corridor, an innovation district south of Manchester’s city centre, running the length of Oxford Road from St Peter's Square to Whitworth Park, and West from Higher Cambridge Street to Upper Brook street in the East. Andrew Fletcher, The Lume’s General Manager said, “With more than 60,000 people calling the district home, with institutions including The University of Manchester, Manchester Metropolitan University and Manchester University NHS Foundation Trust all based here, we are confident that The Lume is very much one of a kind in Manchester’s city centre and are looking forward to meeting guests and visitors over the next few months and beyond”.